It is a real time strategy game where the goal that you have is to build your own town in the western world of Indians, bounty hunters and bandits. 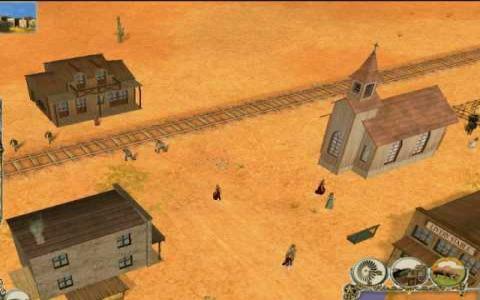 You will basically play as a cattle baron who will first start off a ranch but you will have to save it from the above mentioned characters through appointing gunslingers at your property. Through breeding herds and through and through trading cattle, you will earn money from which you will develop your ranch and then advance on and built your buildings and ultimately built your own town where you will have churches, banks, and hotels etc. The game involves action in the form of some very go shooting which will be done by the men or the gunslingers that you hire. You will also have to manage the health of the men that you hire. There are six different level in the game which have their varied and in depth variety. You will also be transporting goods through different dangerous areas through your men. So it involves a lot of things to do and all have been synchronized well in the gameplay. The graphics, the UI and the controls in the game are also very good. Try Battalia after this one and you will love both.